We are here to help guide you through the process of creating and implementing a financial strategy. The first step is to get to know you and your situation better. This is comprised of clarifying your personal financial objectives and gathering the necessary data to ensure a thorough understanding of your situation. Every family’s financial situation is unique. That’s why it’s so important to find out as much as we can about you and your financial goals. The more we know about you, the more precise recommendations we can make and the more we can help you. Step two consists of identifying problems or opportunities that are present in your current situation. It is in this second step that the full benefit of our process becomes apparent. Issues that you never thought of, problems that you never realized existed will be identified - simply because your financial picture was never so completely developed, and your objectives never so clearly and completely stated. Step three entails the development of recommendations - specific strategies for implementation. Equipped with pro's and con's of each, and an economic model to determine their impact, you'll be in the best position to determine which is right for you. Many strategies you will elect to implement, some now, some in the future, others you will reject. But the decision will be yours. The fourth step is implementation. This is where you take action on our recommendations. You will have a game plan and a specific course of action to take. We will also work with you to coordinate your financial activities with the other members of your team of financial, tax and legal advisors. 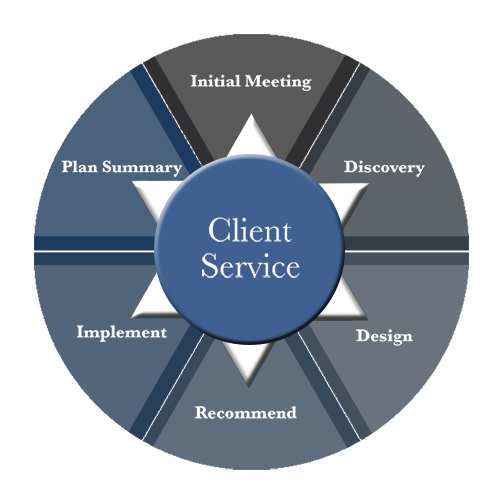 The fifth step is to monitor your progress and provide ongoing service as your needs and situation change over time. Planning is not a one-shot deal. Strategies need to be adjusted periodically as your life changes. We will work with you over the years to help keep your program on track with your changing needs.